The JT Eaton 409 is the first mouse trap on our list. It is currently our favorite kill trap. It provides the best value for its price. Although there are some cases where we prefer the ultimate humane option of a live-trap, in terms of kill traps we feel that this is the quickest and least painful mouse killer. This modern, state-of-the-art device is 2017 version of the old school Victor trap that was unveiled back in 1898. 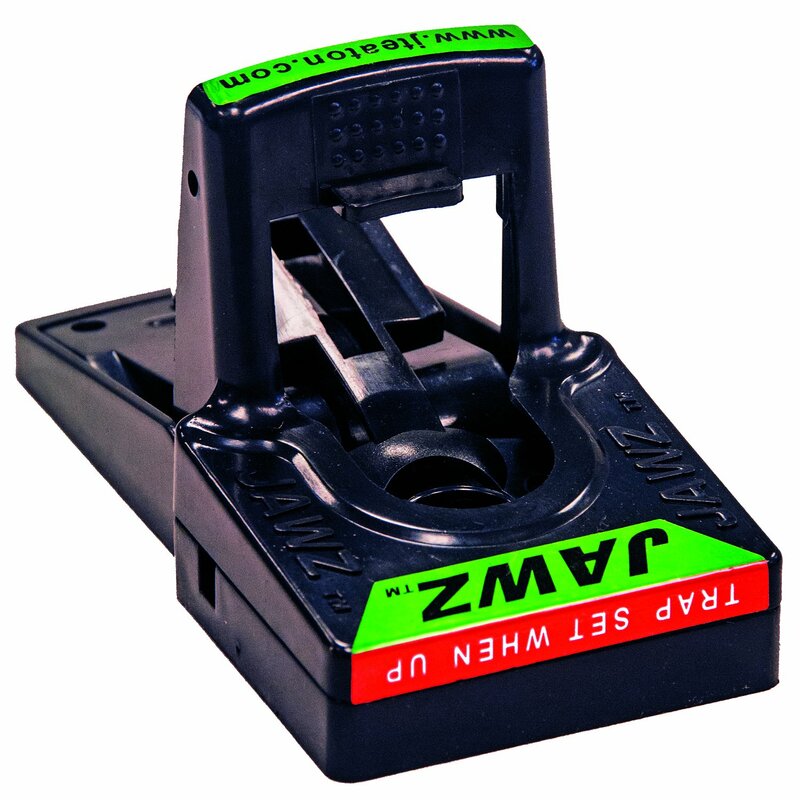 Although some users might be scared off by the plastic material, in my experience this is actually a safer and more reliable twist on the classic wood and metal style snap trap. It’s very easy to set up and some may even say it’s foolproof. There is a whole where you can place either drive or liquid bait, we often recommend peanut butter, then you simply push the lever down until you hear a click. That’s all that’s required, the JT Eaton is now fully functional and will usually catch a mouse within 24 hours. One thing to make sure of is that set up the date in a perpendicular fashion, that way the rodents has to run the width of the trap. If you follow these instructions correctly, there is about a 98% success rate which is much higher than an old-fashioned wooden snap killer. I’ve heard some stories of people catching mice within literally an hour of setting one of these things out. The JT jaws operates on a hair trigger, which never fails to close once an unlucky mouse has had the misfortune of stepping on it. These traps are a little bulkier and unwieldy than the smaller Victor model, but that size comes with the benefit of unmatched strength and effectiveness. It doesn’t matter if the mouse is snapped on the neck directly, or across the midsection, in nearly all cases it will be an instant and painless death which is ideal for people like me who have moral misgivings about pest control in the first place. The price point of these is a little higher, but in cases where they do not break they can be reused unlike the wooden variety. To be quite honest this is going to be an issue with any lower-priced snap trap that you purchase. There is always the offset chance that these can break during storage or usage. The good news is that the company has a one-year guarantee for all unused traps which is pretty much unheard of in this business. If you absolutely need something that’s unbreakable than you might have to move up to a higher price point, or an elaborate electric style trap. Honestly, I don’t think that those justify the price so I just deal with it and actually have never had one personally break on me. Usually you end up buying these things in bulk anyway so in the worst case that you have one out of twelve malfunction, it’s not going to be a huge deal.